swGamers.com is a game site that ONLY includes shockwave games, the shockwave format makes it possible to make great 3D games, that you can play for free online. 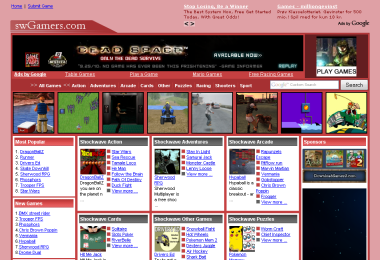 Visit the site and find out how great the shockwave games are. Most free online games are made in flash, so its hard to find shockwave games, that's why the site to not include thousand of games, but the games you find on this site are amazing quality. © 2015 PLEMSOFT. Play Free Online Games - All Rights Reserved.